Pottery Barn Kids have announced a recall of drop-side cribs. The drop-sides can detach if hardware breaks which creates a space in which a child could become entrapped, leading to the risk of suffocation. Drop side incidents also occur due to incorrect assembly and with age-related wear and tear. 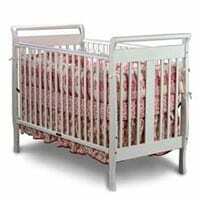 The Consumer Product Safety Commission have received 36 reports of malfunctioning cribs, resulting in seven minor injuries to children. The cribs have been sold from January 1999 until March 2010.